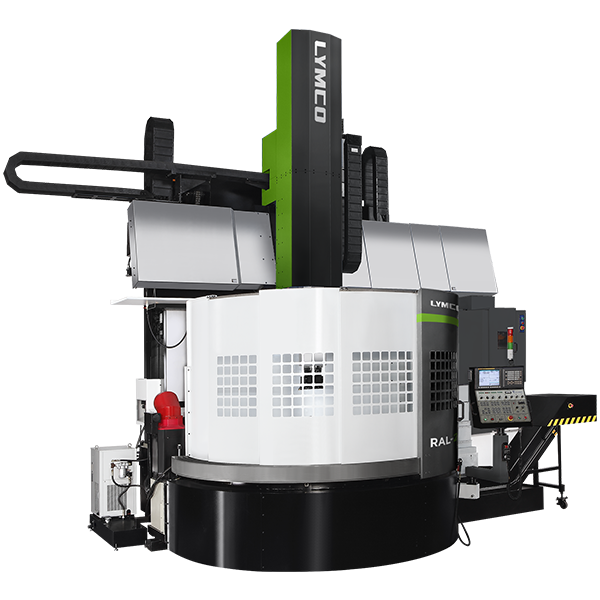 Lymco RAL vertical turning center focus on general turning needs of everyday shops. Designed with octagonal ram and hydro-static table, the RAL vertical lathe can handle deep cuts while enjoying a good clearance for internal boring. Upon adding the C axis function, the RAL vertical turning center is capable of milling, drilling, and tapping on a workpiece right after turning. The movable cross rail provides flexible high and low profile setup. Complete size range of heavy duty and flexible vertical turning and boring solution. Custom options include live tooling, turning height, swing, milling heads, and Y axis. Dual system of floating hydraulic and taper rollers for axial and radial cutting force. 5-position cross rail with independent hydraulic locking blocks. 15°slant bed crossrail design for RAL-16 and RAL-20. The octagonal ram had the strength to handle heavy turning jobs. C axis function is available as optional. Being able to mill, drill, and tap in a single setup greatly reduce the second machining process.